What is an Indiana Last Will and Testament? 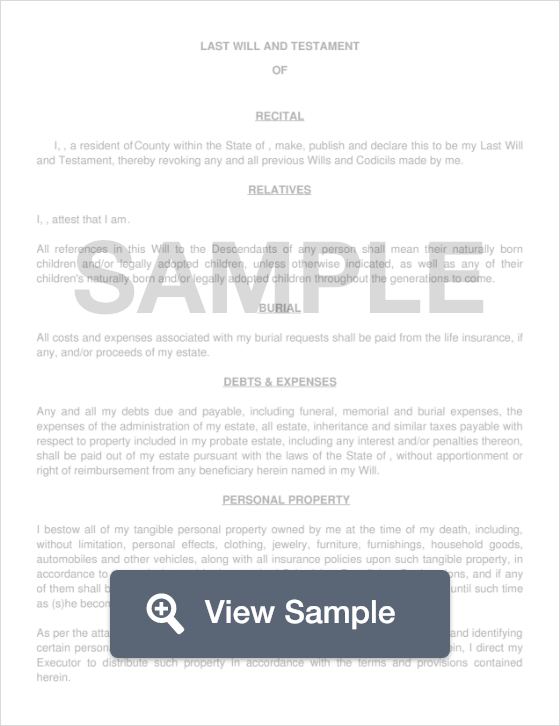 Indiana Last Will and Testament: What Is It? In the state of Indiana, a Last Will and Testament is a means of transferring one’s assets to their children or other beneficiaries without worry that their assets will be taken by an unwanted individual. A Last Will and Testament is a legal document that can be upheld by the state as long as it is signed by two witnesses and notarized by a Notary Public. Although Last Will and Testaments are legal documents throughout the United States, the laws toward them differ from state to state. Here are the specifics for the state of Indiana. Witnesses - According to IC 29-1-5-3, the Will must be signed by two (2) witnesses. Using your FormSwift Template, be sure to fill out all of the titled Sections. Provide Details on any pets, property, or life insurance that you may have. Describe if your children will be named as beneficiaries. If so, provide how much or what percentage of your assets they get. Indicate in your Will if you’d like to set up a trust for someone who requires special care. This can prevent issues with them receiving Supplemental Security or other benefits like Medicaid.